The serene beauty of a Shenandoah Valley woodland as winter gives way to spring. Dotting the forest floor, the scattered orange-yellow blossoms of witch hazel touch the world with color. 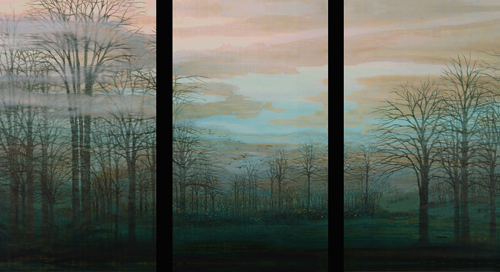 Three 16x28 panels matted in mountain gray and framed in blue-grey-stained oak and under glass, a a first generation work on paper from an intermediate work on a single piece of fir. A striking windblown tree casts its silhouette against the warm sky. 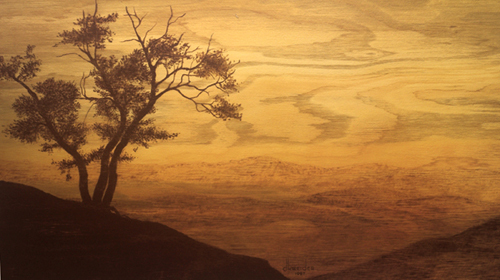 18x30 double-cut chestnut/gold mat framed in oak and under glass, a limited edition reproduction from a pyrogravure colorée on fir, signed and numbered by the artist. 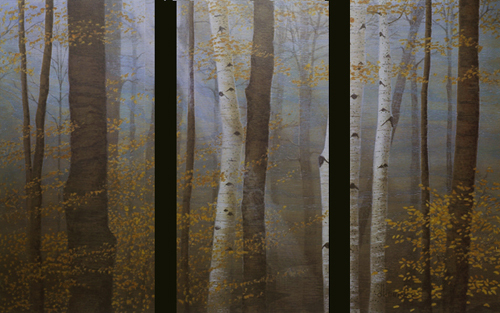 An ethereal woodland of aspen and oaks, as morning sunlight filters through its lingering mists. Available in 22x30, or 20x30, double-cut mat in dark olive and tapestry blue, or divided into a set of three 12x20 panels double matted in dark olive and periwinkle, framed in oak and under glass, a limited edition reproduction from a pyrogravure colorée on Savannah oak, signed and numbered by the artist. Sugar maples in their autumn glory. 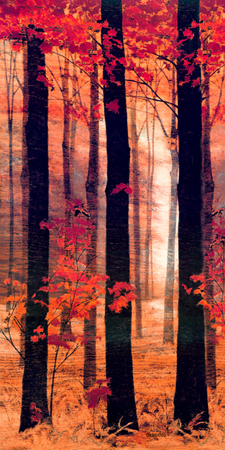 This limited edition reproduction from a multiple media pyrogravure colorée on Savannah oak is available in two sizes - either in a 16x24 double-cut mat in dark olive or ash and trimmed in burnt orange, or in a 12x20 single mat, framed in oak and under glass, signed and numbered by the artist.